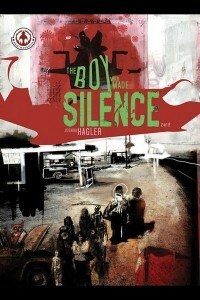 The first issue of The Boy Who Made Silence was an amazing debut for this series. To call it a labor of love by creator Joshua Hagler would be a malign understatement. The level of craftsmanship on display here is breathtaking, with story and visuals harmonizing effortlessly, pushing the comics medium to a profoundly threshold. Issue # 1 was a seemingly simple tale told from the point of view of main character Nestor Gudfred. It was in the telling that Hagler truly broke ground. His visuals were carried along on waves of abstraction that clawed their way towards a deeper, more resonant meaning. To recap a story steeped in bizarre cadences and surreal imagery, Nestor fell in a river at age 10, and thereafter was deaf for life. From then on Nestor, as anyone who loses a sense, experiences the world around him in a wholly different way. This is graphically portrayed by Hagler’s vivid and evocative art, meticulously rendered in watercolor, pastels, collage, photoshop, pen and ink, crayon – all are used to recreate Nestor’s inner and outer worlds. Hagler’s renderings drift from cartoonishness to photorealism, and sport a distinct Dave McKean influence. As the first issue waned, Hagler introduces the bizarre phenomenon emanating from Nestor – he can summon a “scream from deep inside” that for a few moments deafens everyone around him, and also creates utter silence. During this time no one around him can form words or make a sound, and this effect also causes others to see into and experience each others’ pasts and memories. In the second issue, we see glimpses of the lives of the folk in Nestor’s town, beginning with unsavory rednecks minding the drive-thru window at a “MacHardys”, waiting on rednecks only slightly more savory. Hagler utilizes a second person voice to explore the lives of several of the townspeople. The story of Donnie Anderhouse explores the boy’s frustrations with his younger brother, while “Dirty Darrell” feels sullen and restless with his rambunctious family. The visual signpost of a word balloon “spoken” in Darrell’s car containing a drawing of an open hand is used to represent his disjointed thoughts. Trish Heaps is a young unwed mother feeling scorn from the townspeople, while Ryan Echelwelcher is a kid whose grubby and horny best friend, Matt, was fired from MacHardy’s. Matt left along with him. Sarah Belcher is an elderly woman who continually confuses her current husband, Normaldy, with her first, Earl, who died in World War II. Hagler floats through the minds and dissolute spirits of the townspeople, flitting from one to the other in torn, ragged captions containing a typeset font. The mundane and the banal take on a Lynchian cast here. When the spotlight is finally squarely on Nestor Gudfred, he is home for the first time since his accident. When Nestor removes his bandages, he discovers a light in the corner of his eye. Unsure at first, he soon discovers that, as the narration, still in the second person, declares, “The light, it’s coming from your eyes”. The issue concludes with a photo of Hagler himself (I presume) holding a sign repeating the above quote. Has Nestor shattered the fourth wall? I can’t wait to discover where Hagler’s tale is taking us, and especially how he’s taking us there.